Ever since JCB was founded by Joseph Cyril Bamford in a small garage in Staffordshire in 1945, innovation has driven our machines and our thinking. Of course we’ve grown since then but innovation remains at the heart of everything we do. At more than 60 years of age, JCB’s iconic backhoe loader is as fresh and innovative today as when it was first conceived. Since the invention of the backhoe by JCB in 1953, we have continued to innovate, pushing the boundaries and providing real solutions to customer needs. The world’s first… and still the best. Throughout the intervening years, JCB has continued to improve on this basic concept by using innovative thinking and advanced engineering principles. In the process, many of our innovations have become industry-standard features. Like four-wheel drive, for example, as well as extending dippers, torque converter drive, powershift transmissions, all-wheel steer, sideshift chassis, powerslide, and skid steer. As a direct result of our innovative thinking and pioneering spirit, our backhoe loader range has led the world in terms of both features and sales. Today, we’re the biggest-selling backhoe manufacturer on the planet, and have been for decades. We recognise that a large part of our success is down to the fact that we listen to what our customers want. And we’ll be continuing this trend, always striving to build the most productive, dependable and efficient machines that technology will allow. In an increasingly tough market, we’re already attaching particular importance to versatility, residuals and fuel efficiency, all of which you’ll find in abundance on this latest range of backhoe loaders. The 600kg loader capacity JCB 1CX is the smallest model in our backhoe loader range, bringing backhoe performance and capability to previously inaccessible areas. It can turn on its own axis in order to work in cramped environments and it’s fitted with a universal skid steer quickhitch allowing for a full range of skid steer attachments to be fitted easily. Full servo-controlled hydrostatic transmission gives zero to maximum speed, both in forward and reverse, at full power. 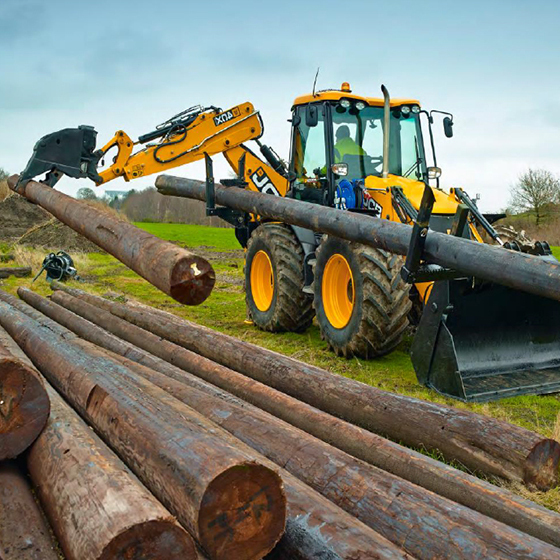 At JCB, we understand the importance of versatility and the differing demands of some very diverse sectors. That’s why we've taken the world’s smallest backhoe loader to new levels. The 1CX has always been a versatile compact machine, offering skid steer and excavator performance in one package. Now, we give you the option of running on tracks with the 1CXT for reduced ground damage, superlative climbing, exceptional pushing power, unparalleled stability and improved soft ground performance. JCB pioneered the backhoe loader concept in 1953, introducing many innovative features to the market. And, in a rapidly changing world, our new 3CX Compact tool carrier represents the latest in backhoe innovation. The JCB 3CX Compact backhoe is a highly versatile, manoeuvrable machine that specialises in a wide variety of duties in urban and limited-space environments. Designed to give you big performance in small areas, it’s perfect for urban working and restricted construction sites. A tight turning circle and switchable steering modes allow it to work in a single carriageway with minimum disruption and maximum productivity. Ease of use, controllability and legendary JCB build quality is also standard on the 3CX Compact tool carrier. 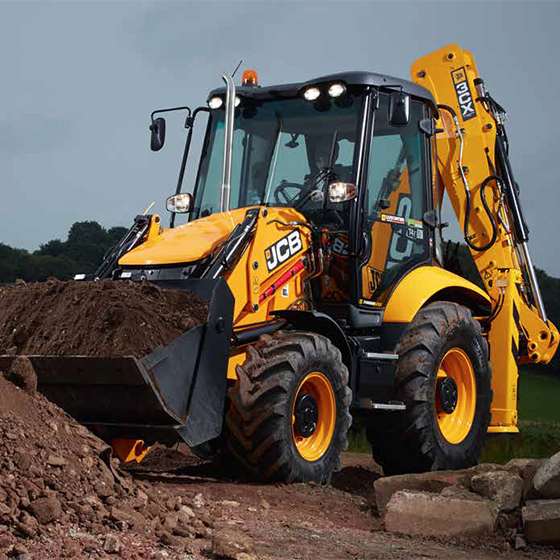 The JCB 3CX is the world’s number one backhoe loader (along with the JCB 4CX). 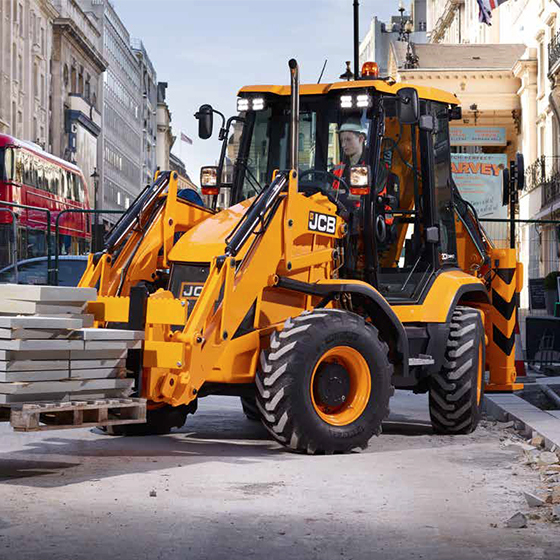 The 3CX is a product of JCB’s efficient design philosophy, responding to today’s rising fuel prices and environmental concerns with class-leading efficiency and low running costs. In short, we’ve applied innovative technologies to squeeze the absolute maximum out of every drop of fuel. The result? In typical roading, loading, excavating and idle cycles, the 3CX JCB backhoe loader, equipped with a powerful Ecomax engine, delivers an average fuel saving of up to 16%, plus lower emissions and noise levels. Also with extended periods between fill ups, you benefit from a longer, more productive working day. 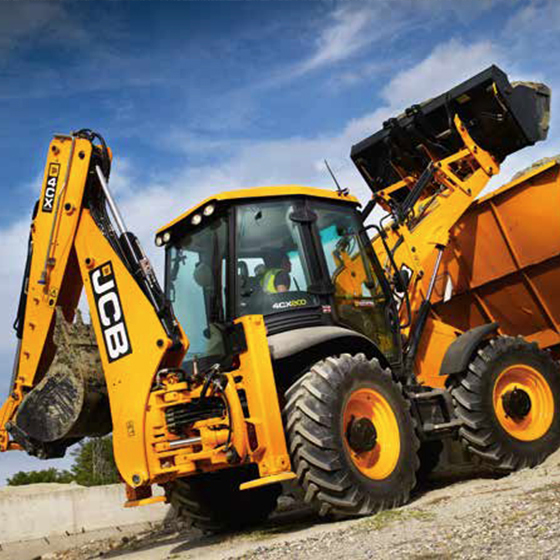 But the efficiency (and other) benefits certainly don’t end there on a JCB 3CX. The JCB 3CX Pothole Master is a highly versatile backhoe loader. Adept at both pothole repairs and all-round utilities work, it represents a great investment for any local authority. Dedicated pothole repair machines are traditionally narrowly focused on filling in roads. The new JCB 3CX Pothole Master offers far more. As a single-machine solution for permanent pothole repairs, this backhoe loader combines a powerful patch planer and sweeper shovel with the facility to operate handheld tools. You can therefore clean, prepare and fix any pothole within a single coned-off carriageway. 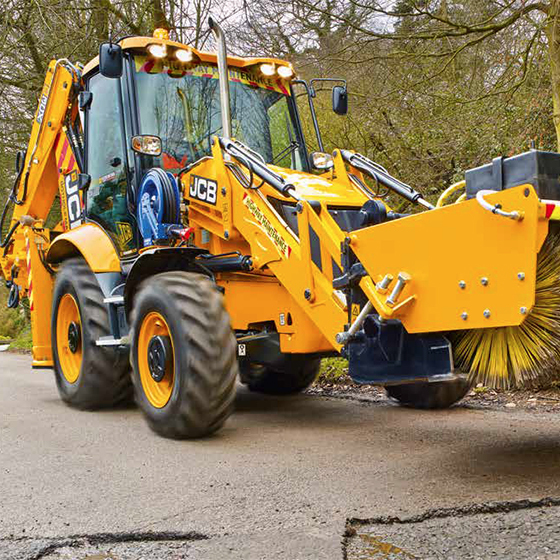 But you’re never limited to road repair work – based on JCB’s versatile 3CX Eco backhoe, the Pothole Master can be used for a huge variety of year-round applications. The 4-wheel steer JCB 4CX is the largest backhoe model we produce, and this latest incarnation really is a product of our 60-plus years as backhoe market leader, bearing a host of performance, comfort, safety and efficiency improvements. The JCB 4CX backhoe is the largest model in our range, boasting 1.0m³ and 1.3m³ option shovel capacity, 3 steer modes and our award-winning new Stage IIIB/T4i-compliant EcoMAX engine. Like our new award-winning EcoMAX engine, which meets Stage IV/Tier 4f legislation without DPF or SCR; compact installation provides uncompromised visibility and manoeuvrability. The 4CX Eco also has high ground clearance and 4 equal-sized wheels, so it can tackle terrain unlike any other backhoe. 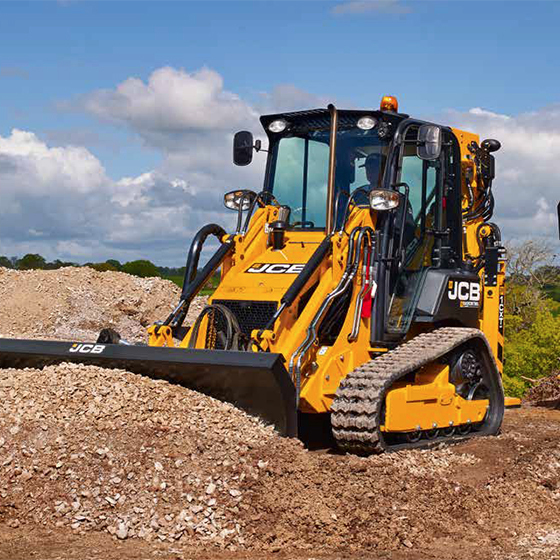 The construction, housing and infrastructure sectors face distinct geotechnical challenges and JCB now offers a unique single-machine solution to help you save money, time and space. 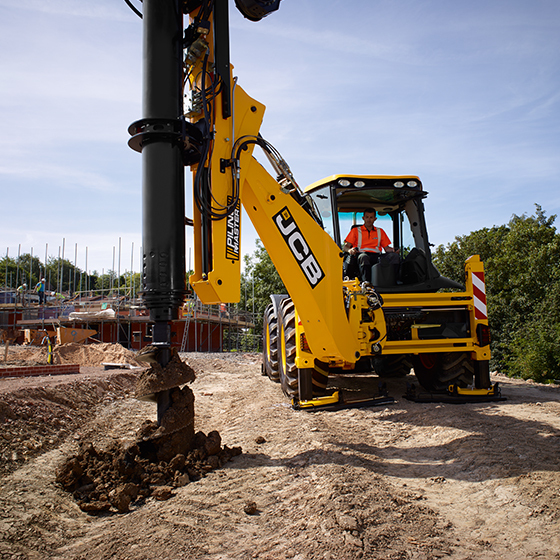 The new JCB Pilingmaster is specially designed for the piling industry, offering you performance to rival traditional piling rigs. However, because this innovative machine is based on a backhoe loader, it’s a true all-rounder offering many benefits. The Pilingmaster helps save on time as it's fast and easy to transport, road legal* and requires fewer piling mat deployments. There are savings in space too. Because the JCB Pilingmaster is based on a backhoe loader, it benefits from the compact dimensions, 180 degree slewing arc and 3 steer modes meaning it can drill piles close to existing structures. The biggest savings are financial, there are proven savings of £3,800 per plot, vs a traditional strip foundation method. With the JCB Pilingmaster the savings soon pile up! If the lines go down and the power goes off, you need to respond quickly. And the ingenious new JCB Polemaster+ allows you to do just that, providing you with a versatile platform to complete the work of multiple machines. First and foremost, the backhoe-based Polemaster+ is self-contained, carrying all the pole planting tools you need on one machine. You can then drive between sites without the need for specialised transport. What’s more, you can drill and plant from one position, which reduces ground damage and, therefore, eliminates reinstatement costs/fines. Introducing the new 5CX Wastemaster to the waste and recycling industry - delivering unprecedented levels of efficiency, versatility and cost savings. Fitted with a package of features, the flexible and productive Wastemaster is transformed into a tailor-made model for arduous waste environments. 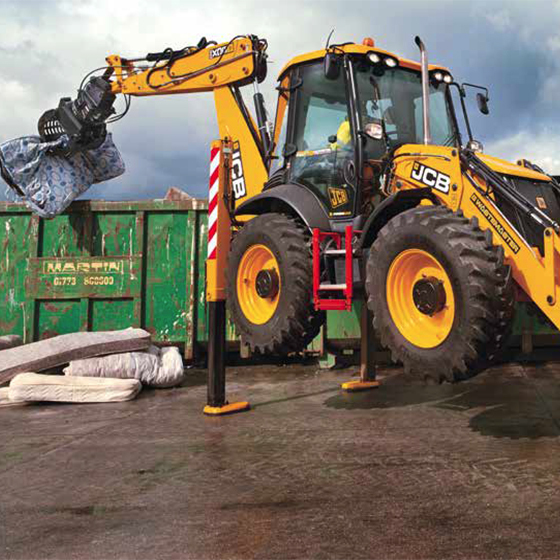 With its ability to power an extensive range of specialist attachments, the JCB 5CX Wastemaster model will excel in the non-stop working environment typically found in all waste handling applications. JCB Jaw Bucket or Selector Grab can improve compaction efficiency by up to 3 or 4 times. The new individual skip hook attachment allows improved movement of containers around site. 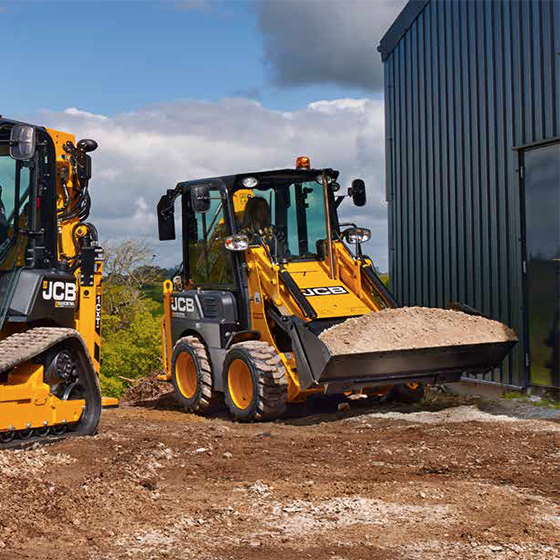 If you would like more information on the JCB Backhoe Loader range please get in touch with your local Holt JCB Salesman.